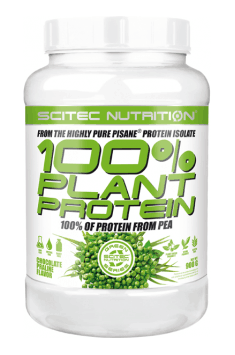 Scitec Nutrition 100% Plant Protein is a highest quality protein diet supplement created on the basis of isolate form proteins originating from yellow pea seeds. It does not contain ingredients derived from genetically modified plants (GMO), it is gluten– and lactose free. It has been designed to ensure the proper amount of protein in the diet, and it is ideal as an addition to healthy dishes, drinks, and after workout shakes, without the negative influence on their taste or color. Pea protein is a protein which was extracted form pea seeds. In the process of its extraction neither organic solvents nor hexane are used. It is obtained through drying and grinding of the seeds into a flour, mixed with water and removal of the fiber and starch. By doing so, only the proteins remain with a little bit of vitamins and minerals. The resulting mass is then dried and grinded into a loose powder, forming a pea protein isolate, which provides around 100 kcal and up to 21 grams of protein in 30-gram portion of the powder. There is a general conviction that the protein extracted from the plants is not full-blown. Nothing further from the truth. Scientists form the Massachusets Institute of Technology have refuted this myth many years ago and have proven that plant based protein contain all of the necessary amino acids. In the research they showed that people were capable of increasing muscle mass using the pea protein supplementation to the same extent as people who were adding animal based protein products to their diet. Pea proteins are a definite exception among plant based proteins, because they have a rich content of all nine essential amino acids, with the exception of methionine. However, it is easy to supplement its amount by adding other proteins of originating form plants, such as rice or oat protein. Pea protein is extraordinary due to its rich EAA content. It provides a powerful dose of BCAA (branched-chain amino acids) – pea protein is 9% of its mass leucine, which holds a key role in building muscle mass. It is worth noting that typical isolates of animal proteins contain a little more, because about 10 to 11% of leucine. Another feature, for which the pea protein deserves recognition is the fact that it consists almost exclusively of protein itself. More specifically, the pea protein isolate is practically 85% of the protein itself, 7% fat, 3% carbohydrates and 5% vitamins and minerals. Comparing to animal based proteins, the whey protein isolate being the purest form of protein – contains about 90% of the protein itself. Pea protein is also characterized by good bioavailability (up to 98%) and slow digestion, which makes it ideal for use before going to sleep. It can also be a better choice in the organism’s recomposition process than whey proteins with very rapid absorption. There is evidence that slow-digesting proteins are more advantageous for muscle growth in the long term due to how amino acids are processed into muscle tissue. In addition, the pea protein is quite satiating, thus inhibiting the feeling of hunger for longer. To sum up, Scitec 100% Plant Protein is the highest quality protein diet supplement created on the basis of pea protein isolate. It is an ideal addition to the diet of athletes and people taking care of their silhouette. It ensures proper amount of necessary amino acids and supports the buildup of muscle mass. It does not contain GMO nor animal based proteins, therefore it is an excellent choice form vegans and vegetarians or people with diary intolerance.